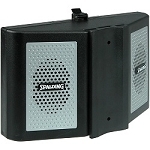 Spalding Basketball Accessories - Electronic 3-Tone Whistle. Shipping Included in the price when shipped to the contiguous 48 United States. 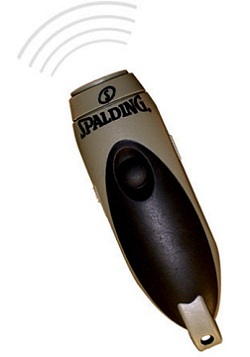 Get optimum performance out of your drill whistle with this electronic whistle. This whistle will replicate the sound of a regular blown whistle with the touch of a button, allowing you to talk while your players are doing drills. The 3 separate tones allows you to coach 3 different drills simultaneously. Ability to talk and activate the whistle at the same time. Replicates the sound of a mouth blown whistle. Three tone feature allows you to coach multiple drills at the same time. Activated by pressing a button. Also a great whistle for officiating sports events. Generally leaves the warehouse within 1-2 business days and spends 3-5 business days in transit. Product package weighs 1.38 lbs. Packaging Dimensions: 9.25" x 6.75" x 5.5". 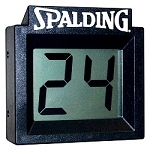 Competitive Edge Products is an authorized reseller of Spalding Basketball Accessories. If you find the 8320 3-Tone Whistle for cheaper anywhere else online, please let us know. We will try to match or beat their advertised price (price of the product + shipping costs).